Many students coming into organic chemistry have a difficult time with a concept that was covered extensively in general chemistry but often forgotten over the summer vacation. This is the definitions of Acids and Bases. It’s an important part of every mechanism in organic chemistry and your professor will likely assume you are an expert and jump right into the mechanisms whether you are ready or not! We here at StudyOrgo have countless hours of combined experience tutoring students in just these situations to get you through the material and ready to ace the exam next month! We have developed comprehensive explanations of the most common mechanisms, but have simplified their explanation in an easy to read format. We also have developed a mobile app of our entire online content that members will be able to take advantage of while studying on the go! Sign up with StudyOrgo today for help with Organic Chemistry this Fall Semester! The classic definition of acids and bases are related to their ability to donate and accept protons into solution. This is referred to as the Bronsted-Lowry Definition. However, in organic chemistry, mechanisms are described by the flow of electrons. Sometimes, an acids and bases can be thought of as their ability to donate and accept electrons. Therefore, acids and bases were given definitions to reflect this feature. This is referred to the Lewis Definition. Let’s look at two examples, first using the Bronsted-Lowry Definition. Reaction of sulfuric acid (H2SO4, the acid) and acetate ion (the base) to produces hydrogen sulfate (HSO4-, conjugate base) and acetic acid (H3O+, conjugate acid). In this case, sulfuric acid (the acid) donates the red proton to acetate, which can accept the proton with a lone pair of electrons. Reaction of ammonia (NH3, base) with water (acid) produces hydroxide (OH-, conjugate base) and ammonium ion (NH4+, conjugate acid). In this example, water (the acid) donates the red proton to ammonia, which accepts the proton with one if its lone pare of electrons. Now let’s look at the same examples, but using the Lewis Definition. 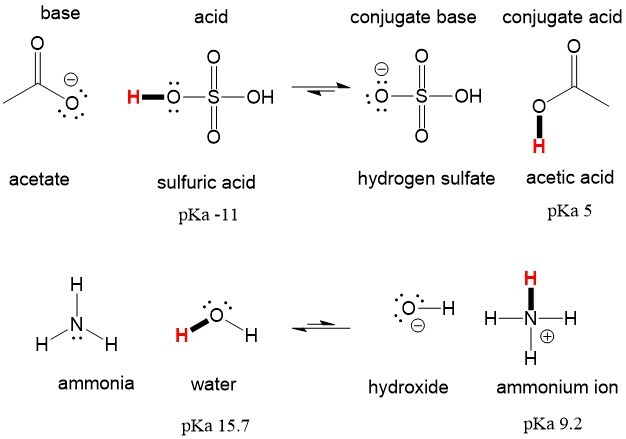 In the sulfuric acid and acetate example, acetate (the base) donates the red pair of ELECTRONS to the red proton on sulfuric acid, which gives the electrons from the green O-H bond back to oxygen to produce the conjugate base, hydrogen sulfate. In the ammonia and water reaction, ammonia (the base) donates the red pair of ELECTRONS to the red proton on water, which gives the electrons from the green O-H bond back to oxygen to produce hydroxide. Both descriptions produce the same reaction, but are THOUGHT about differently. In organic chemistry, you will mostly think about DONATING ELECTRONS, because this is what drives a reaction mechanism. We hope you have found these explanations useful and encourage you to sign up today for more clear-cut definitions of many organic chemistry concepts this semester! Good luck!